CNC New Inc. Has been re-manufacturing CNC Lathes since 1997. We offer a large number of re-manufactured used CNC machines and equipment. Go to our used equipment category to see our current machines available. You may buy all our used equipment online or you can contact us by phone and email to answer any more questions. We replace out of date or no longer manufactured components with new state of the art components. New components offer many more years of use than refurbished parts and many of the older components are no longer manufactured or simply inferior to modern parts. Located in Santa Ana, California we can ship our used CNC lathe machines any place in the United States, Mexico and Canada. Call to discuss a quote for shipping. If you have a Machine that needs rebuilding Call us for a quote. Let us bring your out of date machine back to life. 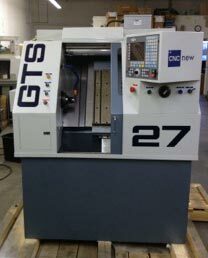 View all our available Used CNC Lathe Machines.